The Shops & Restaurants at Manhattan's luxe shopping center has finally arrived. But, is this innovation or just another mall? New York City may be turning into a billionaire's Disney-style playground, but at least there's no shortage of Champagne. On March 14, the night before the Shops & Restaurants at 20 Hudson Yards opened to the public, it was a swish affair, and it was a perfect microcosm of the space itself: glamorous, exclusive, and gilded, with just enough nods to New York City tradition to give it context. Waiters weaved through the crowd serving posh drinks and themed snacks such as mini hotdogs and tiny ramen burgers, while celebrities such as Anne Hathaway, Lin-Manuel Miranda, and Whoopi Goldberg partied alongside self-styled Instagram influencers taking selfies. Liza Minnelli sang "New York, New York" inside the new 190,000 square foot Neiman Marcus — New York's first — which occupies the top three floors of the space. Stores offered promotions and discounts to lure in the festively-dressed crowd, and artists, musicians and poets were on hand to entertain. A few days before, on March 12, a handful of retail reporters were invited to tour the seven-story, 720,000 square-foot space, which was developed by Related Cos. and Oxford Properties Group, and which features 100 stores and 25 food and beverage offerings. Its towering atriums are faced with glass, laced with escalators, and laid out to take full advantage of the multi-level experience. "People call it vertical retail," said R. Webber Hudson, a Related Cos. executive vice president, as he gave reporters a tour of the space. "I call it vertical hospitality." As of opening day the space was home to many familiar mall retailers including Coach, Uniqlo, Athleta, Banana Republic and Lululemon. There were some vacancies, though 90% of the spaces were leased, and 86% were open on the first day. Stores and food concepts slated to come include Brooks Brothers, Dior and Tiffany & Co., plus maybe an Italian restaurant. They'll join high-end luxury storefronts such as Cartier, Fendi, Chanel and Louis Vuitton, adding retail amenities to what has already been dubbed New York's "Biggest, Newest, Slickest Gated Community," by The New York Times architecture critic Michael Kimmelman. But according to Related's 78-year-old billionaire developer Stephen Ross, this isn't meant to be a candy store for the rich. He told Forbes that his decision to fill the development with retail tenants who can pay high rents is about bringing in "people who have proven themselves able to attract capital." At the press preview on Tuesday, Hudson echoed the sentiment, and said, "it takes seasoned players to compete in this space." Fortunately, a few concessions have been made to accommodate shoppers with less expensive tastes. A handful of mall standards such as H&M, Zara and Sephora, plus burger joint Shake Shack, were included to help make the space feel more egalitarian. Then too, the idea of mall-as-public space is enhanced by a dozen public art installations inside the mall, and tourist attractions such as the 150-foot tall beehive (or trashcan)-shaped Vessel, and the Edge, an observation deck 100 stories and 1,000 feet up, opening in 2020. Still, the entire 28-acre, $25 billion city-within-the-city is exclusive, almost by design. For one thing, it's hard to reach. It's served by only one subway line, the unreliable 7 train, which is home to three of New York City's ten most failure-prone escalators. The few bus lines that service the area drop passengers off amidst a warren of construction work. And while the High Line also terminates there, the park is itself is a testament to New York City's growing gentrification. To be fair, the area is already tony, with an impressively high average household income of just over $161,000, according to reports. It may attract an even more well-heeled tenancy as additional Hudson Yards' housing becomes available. Condos are currently selling at 15 and 35 Hudson Yards for between $4.3 million and $32 million, according to Business Insider, and rent for one of the project's 4,000 rental units starts at $3,400 for a studio. Only 400 rental units, approximately 10%, are set aside for affordable housing. Once all the housing units are filled, they'll help to form a built-in customer base for the shops and restaurants. 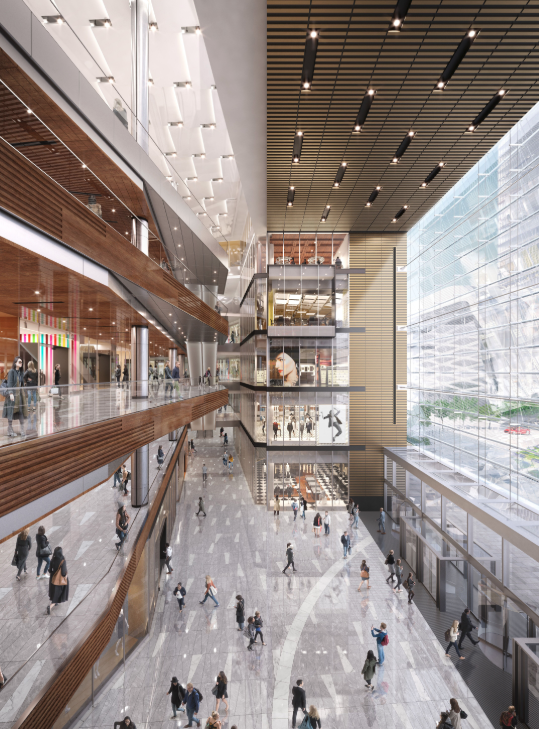 Until then, developers are hoping to boost sales and traffic with help from Hudson Yards' offices, which are home to between 40,000 to 75,000 workers from companies such as L'Oréal, Tapestry and Intersection. The offices will have convenient third-floor access to the retail shops. According to Webber Hudson, he's expecting approximately 40,000 to 60,000 shoppers a day, roughly on par with the traffic at Related's Time Warner Center in Columbus Circle, which is further northeast. He told Bloomberg that he's expecting 40% of Hudson Yards traffic to come from tourists and 30% from office workers in the complex. Assuming at least some of the traffic also comes from the over 10,000 people eventually expected to live there, it's clear that Hudson Yards is not, strictly speaking, designed for everyday, non-Hudson Yards New Yorkers, many of whom are unlikely to make the trek all the way out west anyway. Certainly, there are plenty of perks here for shoppers who do venture out. The mall's second floor, which Hudson called the Innovator's Floor, features a selection of digitally native brands trying out their concepts in brick-and-mortar. "The second floor is the floor of discovery, with stores that are first-to-market and previously in the digital realm," said Hudson. Brands include tech retailer b8ta, footwear showroom M.Gemi, menswear basics company Mack Weldon, and home décor shop Batch. "One third of the [mall's] tenants are first to New York City concepts," according to Hudson. This follows an overall trend of online brands looking for something more tangible. According to a 2018 JLL Clicks-to-Bricks report, digitally native brands are expected to open more than 850 stores nationwide over the next five years. Also on the second floor is Snark Park, an Instagram-friendly exhibition space built by Snarkitecture that includes a Kith cereal bar and retail space. On the fourth floor, there's 3den, a lounge and relaxation space with showers, charging ports, and a swing, where shoppers can buy chill out time in 30-minute increments. Also unique to the space is Dallas-based boutique Forty Five Ten, which has four storefronts across 16,000-square-feet on the fifth level. This is Forty Five Ten's seventh store: other non-Texas locations include Aspen, Colorado; Napa, California; and Miami, Florida. The store's artsy fashion vibe plays well as the younger, hipster friend to the older Dallas doyenne that is Neiman Marcus. Of course, Neiman Marcus is the mall's crowning glory, both in size and in its three-story "penthouse" location. As reporters toured the space on Tuesday, one Related publicist joked that Neiman was "bringing the best of Dallas to New York City." Indeed, with a shop-in-shop for bespoke cowboy boot brand Lucchese, and an outpost of its signature Zodiac Room restaurant, where everything inside, from plates to glassware, is for sale, the store is certainly bringing some Texas flair. But Neiman Marcus is about more than the Lone Star State. There's also a Resurrection Vintage shop, selling high-end vintage women's apparel at prices that range from at $650 to $8500, and an open-flow cosmetics section that brings a Sephora-style, counterless experience to the beauty floor. And of course, there are shoes. Lots of shoes. "We actually have eight thousand square feet of ladies' shoes in the store," said John Walls, director of brand public relations at Neiman Marcus Group, as he led reporters through a tour of the site on Tuesday. Walls was also very proud of the experiential elements the store is bringing into play. Neiman has partnered with local New York artist Minnie Muse to bring in a rotating display of visual elements, including a print of the New York City skyline. And each of the store's entry points opens into something new. "At each one of these entrances we really wanted to create an experiential element," said Walls. Adding a food section to one of the store's entrances was a part of that. "We wanted to make sure that when customers were coming into the store, they weren't just going to be dumped right into handbags and step right into ladies' shoes. We wanted to create an experiential element." Technology also plays a big role. The store is home to a digital styling lounge, which brings personal shopping to the Instagram crowd, and allows 50 digital stylists to talk to online-only shoppers. Street-level pickup for orders is also available, should customers not want to climb through the mall to get their goods. It's all designed to help Neiman's luxury consumer get a more tailored retail experience. “New York is one of the toughest places in the world to be a retailer and stand out from very capable competitors," said Scott Emmons, former head of the Neiman Marcus iLab and now CTO of retail innovation consultancy, the Current Global, in a written statement provided to Retail Dive. Emmons, who was responsible for the technology execution in this new store before his departure, said, "Technology is not the only answer but when combined with the visual aspects, the right merchandise, experiential aspects and so forth, it can put you over the top." In a bold snub to superstition, the Shops & Restaurants opened to the public on March 15. (The date otherwise known as the Ides of March, an inauspicious day for those familiar with Shakespeare). Considering the site's history, that's particularly cheeky. The area, which was once known as "Far West Midtown," was also called Death Avenue in the 19th century, and was the proposed site of the ill-fated West Side Stadium 100 years later. It's not just the location that's problematic. Malls in Manhattan are not doing all that well. In its coverage of Hudson Yards, Bloomberg noted that three other area malls — Manhattan Mall, Westfield World Trade Center, and Brookfield Place — are struggling, with Brookfield losing its anchor Saks Fifth Avenue store after only two years due to low performance. But on Tuesday, March 12, Kenneth Himmell, president and CEO of Related Urban, the mixed use division of Related, was excited. "We spent 7 years putting together this retail and restaurant collection," he said. "We turned escalators into walking sidewalks." And he added that by positioning food and beverage on the upper floors, it would drive people up and into the building. Hudson was also chipper. "We're in the middle of Manhattan," he beamed, despite the fact that Midtown is a 30-minute hike away. He felt certain the shops along New York's traditional retail corridors would eventually come around, and possibly relocate to Hudson Yards. "When you look at the store saturation on Madison Avenue, there are too many stores," he said. "People are consolidating, and stores are looking for flagships." He might be right, at least from a luxury standpoint. Related-owned Equinox hotel is opening in June 2019, and bringing with it an outdoor pool and $700-per-night rooms. And performance space The Shed opens in April 2019, offering musical performances, and possibly even a new home for New York Fashion Week. All told, the combined offerings at Hudson Yards add up to an embarrassment of riches for the otherwise desolate area. Whether it can really turn a train yard into a goldmine, though, remains to be seen. Correction: An earlier version of this story incorrectly identified the percent of spaces that were leased by the opening day. Ninety percent of spaces were leased by that day.